A lot of people don't understand my art. They think I'm trying to shock people, or that I'm romanticizing death or dark ideals. None of these is the case. My work is actually a very deep, ancient conversation. 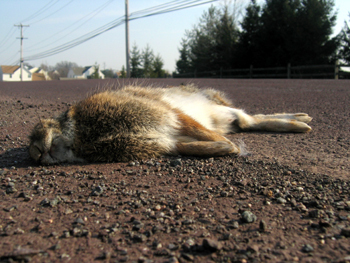 My obsession with taking pictures of roadkill is rather complex. In its simplest form, it is a deeply spiritual ritual that pays homage to our four-legged ancestors, a practice in compassion, and also a raw energetic connection to the natural world. It also assumes a more complex vantage point as a critical dissection of our/my place in the current world, and an apology for our/my disruptive influence upon it. Hovering over these precious vessels that once held life, shining a light in the dark, I have slowly been transforming my camera into a shamanic tool all these years. In many ways, my work creates opportunities for transformation for both the deceased and also for the viewer, and raises further questions about the separation and integration of art, life cycles, and spirituality, from one another. All of life is a delicate balance, with our time in this realm balanced by our passing from it. As a society, we fear death because we do not fully understand it, but even more so because we cannot control it. This is an imbalanced view. Current societal ideals state that we must control as much as possible, shunning any symbiotic relationship with nature, any ideas of impermanence, and anything that is not immediately gratifying to the ego, in favor of the illusion of security, born from control. This upsets the balance of life. In truth, anything that we cannot control becomes almost morally unacceptable, eventually becoming intolerable. In our casual conversations, we tend to shy away from any prolonged observation of our mortality, as it is considered distasteful, vulgar, and sometimes dangerous. The topic of mortality is generally considered to be uncomfortable in the current culture as a whole, and as such, is even sometimes used as a means to steer public opinion. In the end, people seem to be afraid to think of their bodies as merely temporary arrangements of atoms which house an eternal life-force. They are attached to their limited, constructed ways of thinking, and any change scares them. For this reason, my work is often not well-received. Many artists create idyllic imagery of beautiful moments and pleasing aesthetics. This has its place, and serves its purpose. However, we understand from experience that desiring for things to ALWAYS be easy, happy and controllable (comfortable) is unrealistic, unbalanced, and unnatural. It affords no opportunity for growth or reflection, and therefore circumvents the very root of compassion, empathy and resilience. This expectation of ease has become a silent agreement in society that makes us manic, mentally unstable, sick, oppressed and depressed. It turns us into control freaks to the point that we ignore our own ethics and the balance required of life, and actually pushes us towards death even faster at an unnatural pace. Our current practices in consumption, gratification, and apathy are unbalanced and destructive. However, their nature has been aesthetically transformed by a social agreement to focus solely on their pleasurable, attractive short-term attributes as if only they existed. This way of thinking acts as a social lubricant, binding us together in a common mindset, but in reality, the long-term effects of this type of denial quietly rob us of our souls, break down our bodies, and weaken our minds. It leads us to make unconscious choices that we might not sanction with our conscious minds. For example, currently in suburban culture, many people need to drive to get to their jobs. Driving = job = money = food & shelter. Without food & shelter we would die. The short equation is: Driving = Life and its counterpart, Not Driving = Death. So many people drive each day in order to "avoid death" that there are traffic jams and accidents. They are willing to play the odds of taking the life of an animal, a human, or even themselves, in order to try to circumvent a more probable demise, given the above equation. What this boils down to is that those people are willing to swap the (perceived) more probable, eventual risk of losing their own lives, with the (perceived) less probable, more immediate risk of taking another’s life. In this way, roadkill has become an unconscious form of proxy. When we see an animal in the street, most people do not think about this substitution, or recognize them for the sacrifices that they truly are.